Ulen Athram is a Dunmer commoner that lives in the Imperial City's Talos Plaza District with his wife, Dralora Athram. A retired flin trader from Morrowind, Ulen apparently lives the life of leisure in the Imperial City, even though he carries a dark secret: he is a Mythic Dawn sleeper agent and will attack you on sight upon completion of the Path of Dawn quest. Ulen sleeps every night between 10pm and 6am and always starts the day with a two-hour breakfast on the ground floor. Additionally, at 1pm on all normal weekdays (Morndas to Fredas), he will pay a visit to his good friend Soris Arenim who lives right around the corner from Ulen's house. He will stay there until 6pm. After his breakfast on Morndas, Middas, and Fredas, he will spend four hours strolling around the house until 12pm, when he will take a short one-hour walk around the District before visiting Soris. At 6pm, he will take yet another stroll in the District before going home to his wife at 8pm. On Tirdas and Turdas, after finishing breakfast at 8am, he travels to the Market District and spends the morning there, until it's time to pay Soris another visit at 1pm. At 6pm, he will enter the Tiber Septim Hotel and take a two-hour dinner until it is time to return to his house. At 8am on Loredas and Sundas, he will travel to the Arboretum and spend the next twelve hours strolling around amidst all the statues. At 8pm, he heads for the Arena to bet on his favorites, the Yellow Team. When the Arena closes up at 9pm, Ulen heads back to his house and wife for one hour of quality time before his usual bedtime at 10pm. On the 6th of each month, he will get out of bed at midnight and leave the Imperial City for his trip to Chorrol. He will take the Black Road and travel for about eight hours, crossing through both Weye and Fort Ash, before finally reaching his destination. Once there, he will quickly enter the Oak and Crosier, where he will spend time conversing with the other regulars, most notably his "colleague" Eugal Belette. At midnight on the 8th, he will return to the Imperial City and his usual routines. His wardrobe is pure upper-class: a pair of gold trimmed shoes, a red velvet blouse, and matching garment. He carries around his house key and a small amount of gold. Ulen knows the standard Mythic Dawn Armor and Mace spell. When you meet him for the first time, he will introduce himself: "Ulen Athram. Of the Kragenmoor Athrams. Made my fortune in the flin trade, and now I'm here in the city, living the life of ease." He will also give you his take on his former home: "I don't miss Morrowind. All that sour Tribunal grumbling and old-fashioned ancestor worship. Good riddance." If you run into him at the Arena, he will not hesitate to cheer on his favorite team: "It's all about the Yellow Team! Go Yellow Team! Yeah! Woo! Wait, you didn't bet on the Blue Team, did you? 'Cause that would just be plain stupid!" Because the game engine calculates traveling times a bit differently, the above traveling times don't always hold true. 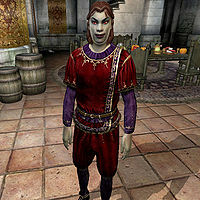 If you wait for Ulen in Chorrol, he will arrive at 4am; if you wait for him in the Imperial City, he will return at 4am. Both times are approximate. This page was last modified on 31 January 2018, at 23:24.